Based on the success of her strikingly original storybook The Fairytale Princess, Su Blackwell's sumptuous fairytale images, cut out from the pages of classic fables, are now brought to life in three dimensions in this beautiful paper theatre. Everything a child needs to re-enact the well-loved story of Sleeping Beauty is provided, including interchangeable scenery and delightful moveable versions of the characters. The covers open out to reveal an ingeniously designed pop-up theatre stage, complete with a set of slot-in scenery sheets, moveable characters and free-standing props. The theatre includes storage for the elements not in use, and an enclosed booklet contains instructions on how to stage your own performance of Sleeping Beauty for family and friends, including a script to follow. 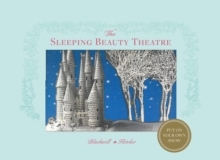 The Sleeping Beauty Theatre will be coveted by children and adults alike.